If you have been following me for awhile, it's no secret that I love pom poms. I honestly hope that it is a trend that will stick around for awhile! I mean, how cute is this dress?! It's so perfect for summer and the material is great for this Charleston heat! And did I mention that it's under $28?! The Nordstrom Anniversary Sale early access starts tomorrow- are y'all ready?! If you need some last minute tips on how you should go about attacking this sale, read my post here! And be sure to check back here on Friday for my top 10 picks from the sale! That dress is darling!! Love those sweet little details! Pom Poms are seriously adorable. I love the pops of color against the stripes in the dress. 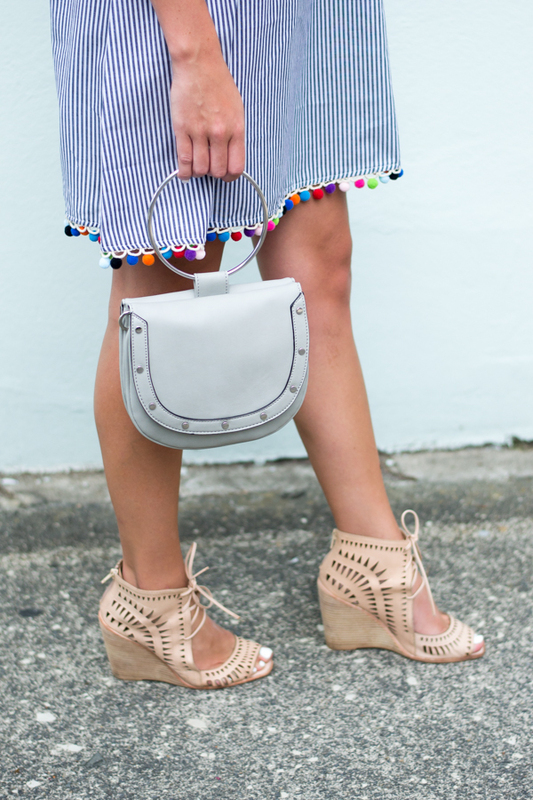 The pairing with the sandals is so chic! Oh same girl! Haha I am obsessed with pom poms this season! That dress is adorable!! 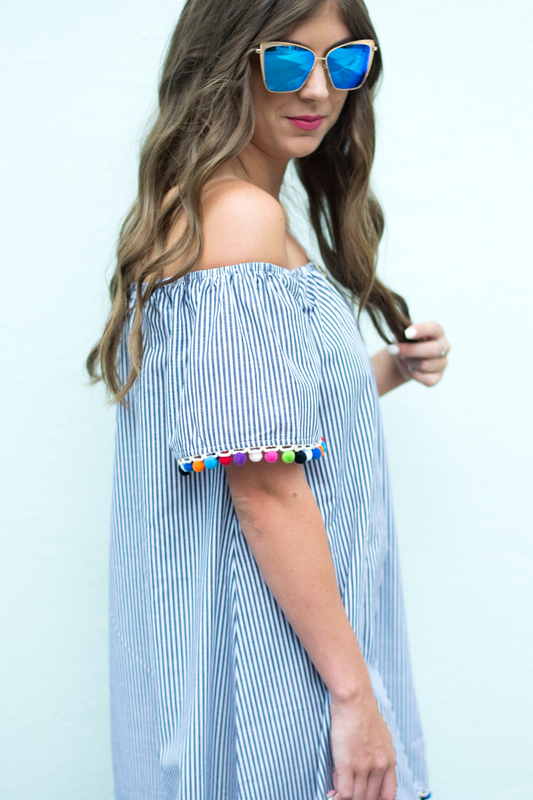 This dress has two of my favorite trends- stripes and pom poms! I LOVE it! You look adorable in it! This is the perfect dress for a fun night out in the summer! Girl, I LOVE pom poms too! I think that dress is adorable, and you look SO cute in it. Love the twist on the classic striped dress! Too cute! I am obsessed with this dress! 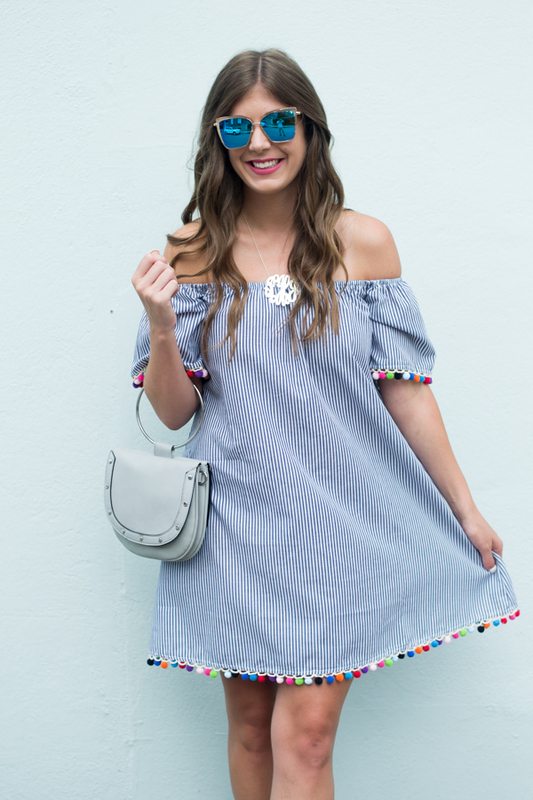 The pom poms make the dress so cute and perfect for summer! I am 100% obsessed with this dress! It literally has all my favorite things: OTS, blue and white stripes and pom poms! 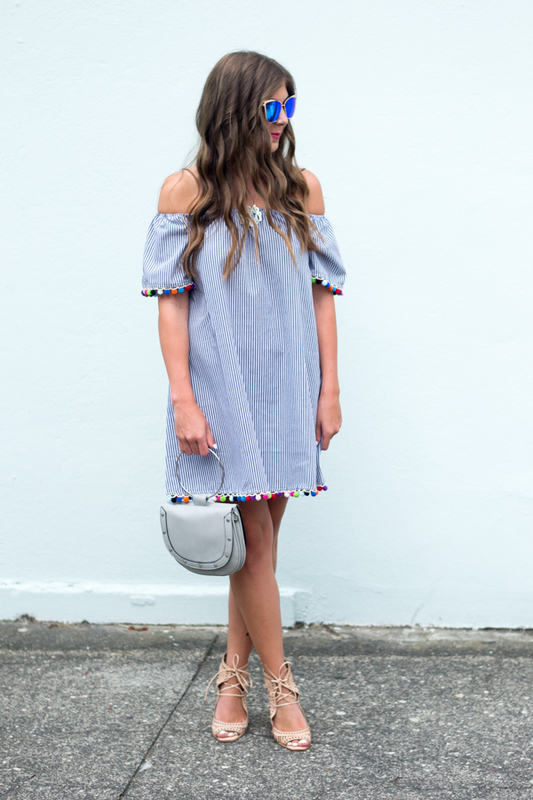 such a cute dress and i love pom poms! That dress is way too cute!! Loving the pom pom trend! Also, need that bag!!! That dress is so cute!! I love that it has pom poms and is off the shoulder! I'm still on a pom obsession too!! and I LOVE how big that monogram necklace is!!! This dress is adorable and I love your shoes!! Love this pom dress and those shoes are to die for! This is such a cute summer dress! I really love the detail on the bag too! Never stop with the pom poms! They are so cute! Pom poms are too cute to stop wearing! Poms are such a cute and fun way to add color and personality to an outfit! You look adorable! Loving the details on this dress!